Issues such as overactive bladder (OAB) and urinary incontinence (UI) affect millions of people, significantly affecting quality of life. In the United States, bladder issues account for $12 billion in annual spending, of which more than $3 billion is for products. 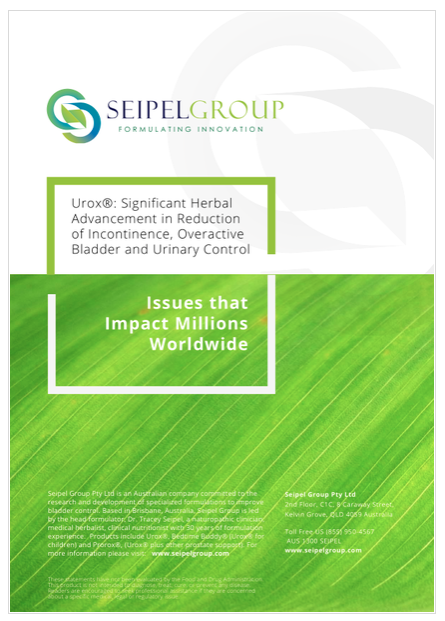 This Whitepaper by Seipel Group examines the potential of the company’s herbal Urox® formula to support the bladder muscles. • Less than half of people with poor bladder control tell their doctor, or even their partner. • One-third of mature adults and half of older adults—both men and women—deal with incontinence. • In a survey of people with OAB, 75% had tried some form of complementary alternative therapy. Download this free white paper to learn more.